These comprise of identical pellets which are designed to satisfy the nutritional needs of the animal. They are generally very boring to look at but are usually tasty to most rats. The idea of these pellets is to prevent selective feeding (where only the tastiest morsels are eaten) and so achieve a balanced diet. This works very well for some animals like rabbits whose natural diet consists of one main ingredient and very little variety but for rats whose diet covers a wide variety of foods, from grain to insects in the country and fast food to vegetable off cuts for their town dwelling cousins, this can be painfully boring. A rat will still probably get a balanced diet from pellets (depending on how nutritionally complete they are) but they will lose a lot of the enrichment and variety that they get from their natural diet or a mix. Rats will still stash pellets and some seem to enjoy them, but it’s not quite the same and they are obviously less excited come feeding time. Still if you have selective feeders and you cannot get them to eat all a mix or muesli then this is an option, especially if it’s supplemented with other interesting fresh foods. The quality and type of Ingredients in many nuggets is also worth monitoring, when you offer food in a nugget form you can use whatever quality you choose, as it is processed to the point where it is not obvious. This means the quality of the pellets can vary a lot. They are also often wheat based (which can cause issues for older rats and their kidneys) and many contain low quality animal proteins. Whilst the move to EU approved animal proteins has ensured that most pet foods don’t contain growth hormones linked with cancers, there are animal well fair issues as well as distrust of particularly chicken and poultry based proteins. Several fanciers have found (possibly incidental) increases in mammary tumours when feeding on a diet reliant on low quality poultry proteins and I know I personally don’t trust them. There are several commercially available rat mixes or mueslis on the market at the current time. These are different from the pellets in the fact they are based on whole grains, seeds, pulses and sometimes vegetables mixed usually with some sort of animal protein and wheat based biscuit (almost always chicken or unspecified poultry proteins). These have the advantage of being closer to a rats natural varied diet whilst offering good vitamin and mineral content as the pellets often have them added. However before buying a shop bought muesli you have to consider a few disadvantages. They are often not ideal nutritionally, make sure the protein content is around 12-14% and fat content is around 4%. Many are higher than this, but can work well as part of your own mix (see later). Again low quality ingredients are often present, some are indigestible to rats, though they may eat them. Look out for ingredients such as alfalfa and wheat feed. One of the main issues with these is not so much the wastage (though this will probably happen), but more that these are often the components that carry a good portion of the vitamins and minerals (which are sprayed on to make up for any weaknesses the mix has). If, or more likely when, your rat fails to eat these they may become deficient. They also take no account of the differing needs of the individual rat both in it’s own quirks and as it changes through life. The protein sources used in shop bought mixes are also not always ideal. Some now contain soya which is an improvement of poultry protein but this is often up for debate, and whilst it is a generally good source of protein there is some contradicting evidence out there. Also many mixes are primarily wheat based, which is harsh on older rats kidneys. The other alternative with shop bought mixes is those sold for other animals, such as rabbits, guinea pigs and even horses and pigs. These often offer a good nutritional choice for rats, and many contain better quality ingredients. Of course there may be some adaptions required, for instance if the protein falls too low, but they can often be very useful, especially if you use them as a base for a home made mix. It is becoming increasingly popular to mix your own ‘rat mix’ as it enables a more balanced diet to be formulated without the downside of many of the commercially available mixes. It also teaches you and those you involve more about nutrition, and can be an excellent method of encouraging healthy eating in children, if you compare their diet to that of a rats. It also needn’t be complicated or particularly scary, just follow the rough guidelines and tweak your diet to suit your rats. Rats let you know when they are truly healthy, they shine beautifully with health and condition, finding the right diet for your rats involves a bit of trial and error, but more importantly than that, the willingness to try something new and a bit scary. Main ingredients are mainly one grain (ingredients are listed in order of the most first) – try and balance this with another mix or mixes that have different main ingredients (such as a wheat based mix, with one that has a large proportion of corn and peas). 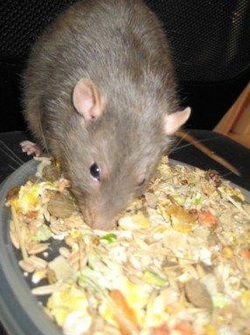 High dependence on wheat or oats – This can be an issue with older rats as they are high phosphorous grains, which put a lot of load on the kidneys (a rat weak point). Try and offset with mixes with lower phosphorous main ingredients such as barley, corn, rice etc. Inedible ingredients – look out for Alfalfa, grass, straw etc., rats may eat them but they can’t really get any nutrition from them (they’re not designed like rabbits), if they’re there it’s not the end of the world, just expect them to be left, and try and combine with others that don’t also contain the same issues. Not great nutritionally – some mixes (including rat ones) are actually not particularly well designed for rats, aim at around 12-14% protein and 4% fat as a good general adult diet. More than that and you can store up problems for later in life. You can off set high protein or fat mixes by mixing it with another mix that is lower than a rats requirement (balances the effect), rabbit mixes are often useful for this purpose. If you get something with very low protein for example (rabbit food can be on the low side) you can add in some dog kibble or other protein source to bring it into an acceptable range. Poor quality ingredients – look out for very vague, none specific descriptions, such as using ‘poultry’ as opposed to a named meat. Also look out for words like meal (this means the protein comes from the stuff blasted off the bones, not true meat as such), also terms like wheatfeed (essentially the left over bits and bobs from processed wheat, likely to be inedible) and it can be worth avoiding lots of additives in terms of e-numbers, colours etc. (vitamin additives are fine) as some have been linked to health issues in rats, though as part of a mix with other mixes that don’t share the issue it shouldn't have a big impact. 2, Make your own mix. This sounds scarier than it is, it can actually be quite a lot of fun. There are some general guidelines to work in, which make sure that the overall mix is nutritionally balanced. Below is a general guide, based off the Shunamite Diet. This is given in percentages by volume, in reality it’s easy to convert into number of scoops (e.g. say 10% is equal to one scoop). Base mix (50-60%) – This can either be a commercially available mix (rat or rabbit etc.) or a mixture of minimally processed grains (often called straights giving you a straights based mix) that you mix up yourself, or buy ready mixed (so far only rat rations that I am aware of have ready mixed based mixtures). Using a commercial mix means you don’t have to add a supplement, but does limit you in terms of mix flexibility and ingredient quality. Using a straights base mix or mixing your own means that some supplementation will be necessary (useually vitamin d, calcium and copper), please see the later for more information. Processed Grains (20-25%) – This section is made up of grains that are more processed, so easier to digest. These are nice and easy to find, using human breakfast cereals that are low sugar (aim for less than 5% if possible, value stuff is generally the best). If you aim to get at least 3 different grains, minimising wheat and oats when they get older it will be great. Some ideas I use are; mini wheat pillows, rice pops, value cornflakes, broken up egg noodles, assorted pasta shapes (I like spelt and other interesting grain pasta’s), broken up ryvita, broken up rice crackers (plain), rice flakes (Indian section), wholegrain rice, pearl barley etc. Protein elements (5-10%) – if you’re using a rat muesli, or a base that already has protein added then you don’t need to add this section, as your rats age they will need less too. There are many options for protein sources; the easiest is going for a good quality dog kibble (fish ones are the least farmed and kindest on the kidneys so usually preferable). You can also use more natural ingredients, to try and mimic what our rats have evolved to eat, such as dried insects, fish and shrimps (shrimps are the best nutritionally, as there low in fat and high in protein and copper). There’s also using egg biscuits or dried protein, and there are vegetarian options like pulses (lentils, peas, roasted soya beans, soya protein etc). In an ideal world a mixture minimises any weaknesses and offers your rats lots of exciting variety. Herbs and veg (5-10%) – this is the section you can change each time if desired and is generally the most flexible. It helps add in vitamins and minerals as well as flavour and variety. You can get dried veg from rat rations, supermarkets (sold for soups) and online. Herbs wise your best going for those herb mixes sold for Rabbits, rather than human herbs (as they’re often chopped up too small), but there are some great mixes sold as natural treats for various animals. There are also many herbs with possible health benefits, and though these should be used carefully they can help support a rat alongside vetinary medication. Seeds (5%) – These add valuable Omege 3 and 6 oils, and are usually very popular with the rats. A good mix of healthy seeds is very useful, hemp, linseed and pumpkin seeds are a useful starting point, with a nice varied parrot seed mix or even human mixes bought from supermarkets being easily available. Don’t be afraid of offering some tiny seeds too (though work up to them) as a determined rat can normally locate even a tiny grass seed when scatter fed. It can be tempting to drop this section down if your rats look overweight, thinking it is caused by too much fat in the mix, but it’s better to drop the overall amount of food down, as it can lead to a really dry coat and skin, rats do need fat in their diet, and generally it is excess calories rather than fat that causes obesity in rats (unless they receive a very high fat diet). Supplements – If your feeding a mixture made of a rat rations base mix, or a mixture of grains (Straights based mix) you make yourself it will be deficient in certain minerals (mainly calcium, vitamin D and Copper) shop bought pet foods have these sprayed on them in the form of a vitamin spray. Young fast growing rats actually benefit from extras of these anyway so there worth knowing about even if you feed a shop bought mix. The easiest way of doing this is to use Dr Squiggles Daily Essentials (a powder you add to drinking water, can be bought from rat rations) and Dr Squiggles Calcivet (a liquid you add to drinking water). See supplements section for more information and alternatives. 3, Buying a ready-made Straights based or Commercial based mix - This is probably the easiest option, they are now readily available from rat rations, and often people are willing to sell their mixes locally too. It is worth taking time to choose the right mix for your rats stage of life, there are several options available now, including those designed for fast growing rats, adults and the ageing. This option may be more expensive than a commercial mix or mixing your own, with postage and packaging involved, but for a small number of rats it’s normally not a massive expense. If the mix is straights based, then you will still need to add supplements. Mixing this option with a good commercial food, or with your own mix can also work very well, and add variety.